I love a good sci-fi/fantasy MM, and FT Lukens was pretty good at drawing me into the story. So we have Ren, your typical cliche boy who wants to leave his planet for bigger and better things and finds out that he can actually control electricity…or maybe has the ability to control techno weapons/machines/ships/etc. Though it’s cliche, the intro was pretty interesting with the kidnappings of children. In the evil lair, he meets Asher. I liked Asher, but I just wish there was more romantic scenes between these two characters. That’s why it’s a 4. There were parts where it dragged, but it didn’t make me lose interest. I wanted to find out if Ren and Asher gets together, if Ren controls his ability. It was actually a pretty awesome ability. His word tangled in his throat, cut off, because suddenly, Ren was consumed with power, rushing from his toes to his fingertips. A blue tint clouded his vision, and his body suffused with golden warmth. And then he was floating amongst the wires, connected to the ship, to the energy source, to everything. The lancer pulsed under his skin, tangling in his veins, its systems integrated with his senses. Hi, everyone. This is F.T. and I’m here to talk about The Star Host, which is my debut novel. It is a science-fiction adventure which features a bisexual main character, and a diverse cast of characters. The novel follows, Ren and Asher, as they navigate political intrigue, a growing power, and their own relationship as they journey across planets, spaceships, and drifts. 1) How do you feel about e-books vs print books? I love both. I think there is a place for both of them to exist. E-books are great in that I can fit several of them on my kindle and can take them with me anywhere. They’re usually cheaper, and you can get them in an instant, which is great for me because sometimes getting to a book store is difficult. But I also love books. I have… well embarrassingly too many bookshelves in my home that are stacked full of books. And I keep adding to them. Sometimes, I really want to feel the weight of the book, smell the pages, and experience the story in that way. Another thing I love about physical copies is the fact I can write in them, and share them. I had a professor in college that introduced to me a great habit. When I finish a book, I write the date on the back page. If I do a reread, I’ll add that too. It’s a fun thing to do to document and to compare your perceptions of the story from date to date. For books that I really love, I have an ebook copy and a physical copy. 2) What process did you go through to get your first book published? Actually, this is an interesting story. I had followed Interlude Press since their inception. And I was really intrigued about their model and how they worked with their authors. When they announced they were going to have an open submission period, I knew I wanted to have something to send into them. 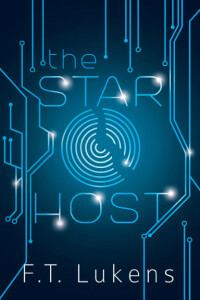 I wrote The Star Host over the course of four months. And I submitted it in June. I received an email in August while I was at work. The first line was a rickroll because it totally read like a rejection letter. But the second line said they loved the book and wanted to talk. It was amazing. As great as this story is, I don’t want to give anyone the wrong impression, that I wrote something on my first try and submitted it and it was accepted. That wasn’t quite the case. While I was waiting to hear back from Interlude, I talked with a few individuals in traditional publishing roles. A lot of the feedback was that the story wasn’t right for them, which is a common response to receive. But I did receive some feedback that said the romance between the two characters, Ren and Asher, should be changed – either to an unrequited romance, or to a bromance. It was disheartening to hear that, especially since I really am an advocate for diverse books and representation in young adult novels. That said, I’m happy that The Star Host as found a home, and will be able to reach the audience it was intended for. I’m glad that indie publishers like Interlude exist, and are able to promote diverse stories when other avenues still feel resistant to them. 3) How do you find or make time to write? This question is pretty much my life. I have a full-time job and three kids. I have to make time to write. I usually write very early in the morning after my kids have left on their buses and before I have to get ready for work. I also write very late at night, after everyone else has gone to bed. If I can squeeze in some writing on my lunch break, I do that as well. As you can guess, I drink a lot of coffee. 4) Name one person who you feel supported you outside of your family members? 5) Tell us about a book you’re reading now. I am not reading anything right now because I’m scrambling to get some work done currently. But, I am so excited to get my hands on Kings Rising, the third in the Captive Prince series. I want to read that book so much, but I want to do a reread of the first two before I read it.